Northern Java’s deltaic shorelines suffer from land subsidence and severe erosion, in some places more than three kilometers of land has already been taken by the sea. This is mainly caused by removal of mangrove belts, unsustainable coastal infrastructure and aquaculture and groundwater extraction. Catastrophic ﬂooding occurs during high tides, storm surges and periods of excessive rainfall. In the long term, over 30 million people face the risk of losing their houses, roads, and valuable arable land. Hard structures like dams and sea walls have proven to be ineﬀective as a single solution along rural mud-coasts and often exacerbate erosion. They also tend to be expensive and unstable as they are incapable of adapting to climate change. Furthermore, they fail to provide the vital economic, environmental and social services that healthy mangrove belts provide. The "Building with Nature" approach combines nature based solutions, such as mangrove restoration, with hard-engineering techniques to restrore mangrove coastlines that reduce flood risk, erosion and saline intrusion and may be able to adapt to sea level rise. It takes a multi-stakeholder approach for addressing all the root causes of vulnerability and for the introduction of sustainable multifuntional land uses that enables vulnerable communities and economic sectors to prosper, be more self-reliant and resilient against hazards, once the coastline is stable. Using the “Building with Nature” approach, we combine green (nature- based) solutions, such as mangrove restoration, with grey (hard engineering) techniques such as dams and sea walls. In this way we make use of the power (services) of nature instead of fighting against it. With this innovative approach we will build stable (restored) mangrove coastlines that reduce flood risk, erosion and saline intrusion and can adapt to sea level rise. Simultaneously, we take a multi-stakeholder approach for the introduction of sustainable multifunctional land uses that enables inclusive economic growth once the coastline is stable. Building with Nature addresses the root causes of vulnerability, is cost-effective and sustainable over time. It boosts inclusive economic growth while improving living conditions. Our dream is to replicate this model in rural and urban coastlines in Indonesia and beyond. The downloadable brochure below shows the results of the pilot project in Timbul Sloko where permeable dams were used for reclaiming the eroded land. The waves are now clearly much lower inside the grid of permeable dams than outside. In some cases, pioneering mangrove trees are already testing the ground. It explains the next steps of the project and our ambitions with Building with Nature in Indonesia and beyond. 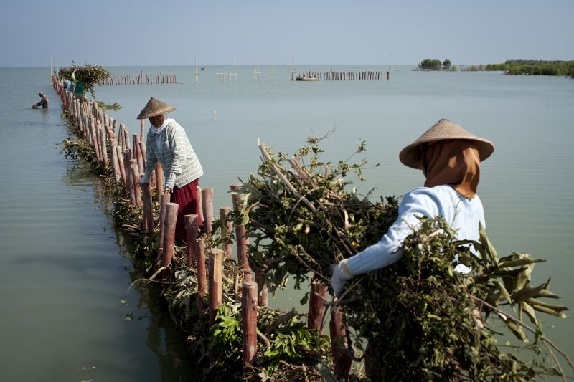 Reclaiming the land, restoring the mangrove beltIn rural areas. We apply soft engineering measures such as the construction of grids of permeable dams (see cover photo), mud-nourishment and agitation dredging along with mangrove rehabilitation to reclaim the land and restore the fine sediment balance. We work with and along sea currents, river flows and waves rather than fighting against these natural processes. In urban areas where there is little space, hard engineering techniques are strengthened by mangroves belts thus diminishing costs of maintenance while increasing value for example recreation. Climate smart and productive land-use. The restored coastline will enhance protection against natural hazards, protect arable land from erosion, revive fisheries and (non-timber) forest products, improve water purification, enhance carbon storage, as well as offer opportunities for recreation. But we will do more to boost the economic situation and to ensure a sustainable socio economic system. To avoid unsustainable practices from returning, we will introduce sustainable aquaculture which can co-exist with a healthy mangrove forest. This will substantially enhance shrimp production and near shore fisheries, two important engines of economic growth in the area. Securing long-term maintenance of mangrove belts. To ensure the sustainability of our initiative, and to enable replication in other areas, training and embedding the approach in policy and planning are crucial elements from the first till final phase. We support integral solutions for improved coastal zone management by contributing to the development of a Master Plan, together with communities, government, private sector and civil society. This plan will address the root causes to coastal vulnerability, sustainable land use and finance options that together ensure the long- term maintenance of a stable coastline and its ecosystem services. Building with Nature was initiated by Ecoshape, a consortium of private parties, government organisations and research institutes. The aim of Building with Nature is to utilise natural processes and provide opportunities for nature while realising hydraulic infrastructure, thereby developing sustainable and integral engineering solutions.